The first pool tables were mainly owned by monarchs and noblemen because the cost of having one built by a cabinet maker and imported was very high. However, the working classes often built their own crude versions of pool tables. Unfortunately because the table beds were made of wood they often warped within a few years. There was no standard size or shape to the early pool tables, and many early pool tables, billiards, snooker tables models were square, eventually changing to oblong (usually twice the length to width). By the 1500s, home pool tables were common in taverns and public places throughout France. In 1826, the pool tables took a dramatic change as John Thurston of England invented the slate bed, giving the table a far smoother surface. Marble was used by some people but the cost of pool tables were far too high. Billiard slate was a lot heavier than wood, and thanks to it pool tables were a lot sturdier. In 1845 Thurston was granted a patent and starting making the billiard cushions out of vulcanized rubber, cork and leather. Later on, the green cloth/felt pool table cover / billiard table cloth was also improved upon, and added to the new slate tables to produce a pool table similar to those used today. A rectangular table with cushions bounding the playing area and six pockets.Pool Tables are a perfect way to add fun to almost any setting and are a fantastic addition to any basement or recreational area. If you're a billiards enthusiast and have the floor space in your dwelling, pool tables are the ideal addition to any home. Our designer and cheap pool tables are also exported to shenzhen, China and overseas. We are New Delhi's leading dealers of carrom tables, pool tables, table tennis tables and billiard pool tables. Pool table accessories are highly important pieces that will help you ensure the highest quality game possible while keeping your table's longevity intact. Ball racks, replacement pool table felt, pool cue chalk, pool table hooks, pool table brushes, pool table covers and scoring accessories are all important items that you can easily find online. Pool Chalk will prevent the tip of your cue from slipping off the cue ball when taking a shot. You must always have pool chalk handy to play! Some of the more popular brand names are Master Chalk and Silver Cup Chalk. Make sure that you buy non-lead chalk, as dust from your chalk will linger on the table, floor and your clothing posing a potential long-term health risk. Tip: Pool chalk comes in many various colors, so match your felt color with the color of chalk you purchase to minimize visible dust on your table surface. Pool table brushes are key when you are trying to keep a finely groomed playing table. Brushes will keep your pool table felt clean and tight, giving it a long lasting life and beautiful looking finish. It is a good idea to have a table brush and use it every two weeks to keep your table clean. Pool table covers are a must for all pool tables. Keeping your surface scratch and spill free is definitely a high-priority. If your table is not being used, make sure the felt is covered to reduce dust collection or even sunlight fading. Pool table scoring is important for specific games, and will allow you to keep track of points and win-loss records. Chalk boards, tally balls and bottles, and game beads are popular scoring devices that won't cost you much to add. Panchal Billiards professionals in offering a supreme range of Sports Nets, which is accurately designed keeping in mind the varied requirement of sports. Our assortment is made from HDPE, PP and cotton twine material as per the set quality standards. Our collection is free from any defects and damages. These are properly packed using superior quality materials as per the choices of our clients. To add to the beauty of the Billiard Table, we offer in the market exquisitely designed Billiard Table Cloth. Billiard Table Cloth that we deliver in the market is manufactured using superior quality fabric. 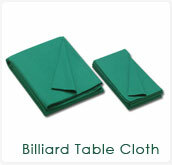 Customers are eased with the availability of Billiard Table Cloth at pocket friendly prices. 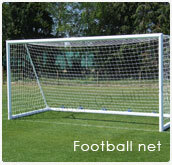 Panchal Billiards Manufacturer and suppliers Football Net Our Football Nets are available in different sizes & colours. We are introducing our excellently designed and fabricated range of Single Extra Thick Nets which is made out of fine HDPE material. This material is used to improve the functional life of the net and also offer superior finish to the products. Our fabulous collection is available in standard sizes and in yellow, blue, white and orange colors as per the specifications of our clients. Panchal Billiards Manufacturer and suppliers Tennis net For Traditional English & International Tennis Posts Selection of Tennis Net for all Budgets & Levels. We can promise you will not find better quality tennis net Each tennis net is manufactured to last and not manufactured just to be a cheap tennis net. Our top tennis net has a 2 year warranty - we are the only tennis net manufacture to supply a guarantee with a tennis net With our range of tennis court nets & tennisnetz we are sure to have the perfect tenins net for you! 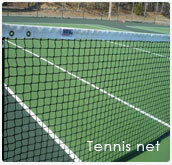 All tennis nets can be delivered next day. 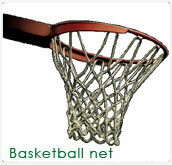 Panchal Billiards Manufacturer and suppliers Basketball Net Along with Basketball becoming a international sport it is also one of the most popular recreational sports for family friends. At Big Game Hunters we want everyone to join in the fun and so have br ought out a range of Basketball Nets for all ages, for school and home use. The Sure Shot Equipment is Internationally approved equipment and provides great game play. We are sure you will find a great basketball stand in the range. The first pool tables were mainly owned by monarchs and noblemen because the cost of having one built by a cabinet maker and imported was very high. However, the working classes often built their own crude versions of pool tables. Unfortunately because the table beds were made of wood they often warped within a few years. There was no standard size or shape to the early pool tables, and many early pool tables, billiards, snooker tables models were square, eventually changing to oblong (usually twice the length to width). By the 1500s, home pool tables were common in taverns and public places throughout France. In 1826, the pool tables took a dramatic change as John Thurston of England invented the slate bed, giving the table a far smoother surface. Marble was used by some people but the cost of pool tables were far too high. Billiard slate was a lot heavier than wood, and thanks to it pool tables were a lot sturdier. In 1845 Thurston was granted a patent and starting making the billiard cushions out of vulcanized rubber, cork and leather. Later on, the green cloth/felt pool table cover / billiard table cloth was also improved upon, and added to the new slate tables to produce a pool table similar to those used today. Pool Tables A rectangular table with cushions bounding the playing area and six pockets.Pool Tables are a perfect way to add fun to almost any setting and are a fantastic addition to any basement or recreational area. If you're a billiards enthusiast and have the floor space in your dwelling, pool tables are the ideal addition to any home. Our designer and cheap pool tables are also exported to shenzhen, China and overseas. We are New Delhi's leading dealers of carrom tables, pool tables, table tennis tables and billiard pool tables. Pool Table Accessories Pool table accessories are highly important pieces that will help you ensure the highest quality game possible while keeping your table's longevity intact. Ball racks, replacement pool table felt, pool cue chalk, pool table hooks, pool table brushes, pool table covers and scoring accessories are all important items that you can easily find online. Pool Chalk will prevent the tip of your cue from slipping off the cue ball when taking a shot. You must always have pool chalk handy to play! Some of the more popular brand names are Master Chalk and Silver Cup Chalk. Make sure that you buy non-lead chalk, as dust from your chalk will linger on the table, floor and your clothing posing a potential long-term health risk. Tip: Pool chalk comes in many various colors, so match your felt color with the color of chalk you purchase to minimize visible dust on your table surface. Pool table brushes are key when you are trying to keep a finely groomed playing table. Brushes will keep your pool table felt clean and tight, giving it a long lasting life and beautiful looking finish. It is a good idea to have a table brush and use it every two weeks to keep your table clean. Pool table covers are a must for all pool tables. Keeping your surface scratch and spill free is definitely a high-priority. If your table is not being used, make sure the felt is covered to reduce dust collection or even sunlight fading. Pool table scoring is important for specific games, and will allow you to keep track of points and win-loss records. Chalk boards, tally balls and bottles, and game beads are popular scoring devices that won't cost you much to add. Having great pool table accessories Panchal Billiards make a huge difference in the quality of your game, both in how well you play and in how much you like to play. There are lots of accessories that are so necessary it's hard to call them just accessories, and there are items you can buy that will be a big help but which you can play without if you'd like. Here are some of the more popular and essential pool table accessories that you can work with if you so choose.Panchal Billiards suppliers offer a large selection of pool tables and accessories. Most pool table suppliers stock tables for all lifestyles and preferences.Panchal Billiards supply customers various quality solutions to suit their growing needs, providing descriptions of their top models and regularly updating catalogues.Panchal Billiards also stock a full range of pool table accessories and equipments including pool table felt, covers, cue sticks, chalk, balls, and racks. Most suppliers stock refurbished or used pool tables along with the new tables. Panchal Billiards Manufacturer and suppliers Volleyball net The standard tournament size of the Volleyball net is 32' x 3'. 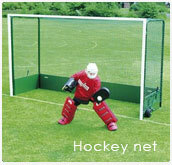 These nets are commonly made up of fine quality nylon. Our elegant Volleyball Nets have braided netting with Vinyl coated steel cable or Steel Aircraft Cable on top and bottom. There are side pockets and wooden dowels and vinyl tapes at the top, bottom and sides of the net. Braces are included for additional net tension and strength. T op tape has vinyl tabs at every mesh to help the net hang square. 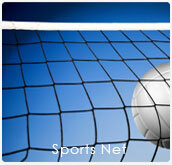 We provide Volleyball nets rather economically in various colors including red, white, blue, and yellow. We are involved in the Manufacturing and Supplying of exquisitely designed Pool Table. Designed with perfection, our Pool Tables have become a preferred choice among the buyers. These tables are stringently tested on certain quality parameters before dispatched in the market. Pool Tables offered by us are obtainable at most discounted prices.